Learn how to properly cut a notch in the trunk of a tree to safely cut down a tree in this free how-to video. We are going to discuss how to cut down a tree safely today. This video is brought to you by Black Dog Video. You can visit it on blackdogvideo.biz. Perpendicular to this line right along here, is where it wants to fall. So if you took a T square and put it perpendicular to that, that’s where it should fall. Now a big factor in that obviously is where the tree initially wants to fall which is a little bit this way. We have got the cable going this way to counter it back and when we cut through the back, we have got to cut through evenly on both sides. We cut through one side first. It is going to tend to fall away from the side you cut through first. So our next step is going to be cutting down at an angle here to actually make the felling cut. George Finn is an expert in mechanical systems. He has a Masters Degree in Mechanical Engineering from Rensselaer Polytechnic Institute. George is a licensed engineer and licensed home inspector who holds two U.S. and European patents. 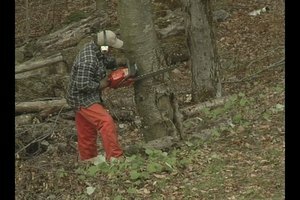 George has been felling trees and cutting wood for firewood for over 30 years. His most recent project involved him personally felling and cutting firewood from 80 trees. How Tall Is a Douglas Fir Tree?